(l to r) Susie Damilano as Didi Marcantel, Cathleen Riddley as Mrs. Jessalyn Price, and Carl Lumbly as Leo Price in SF Playhouse’s regional premiere of Julie Hebert’s “Tree”. Julie Hébert’s “Tree” was a 2010 recipient of a PEN Award for Drama, and is presently receiving its regional premiere at the SF Playhouse. It is easy to see why. Hébert is a writer of exceptional polish who has succeeded across the board on Broadway, television and film. Her expertise is evident in every detail of “Tree”. 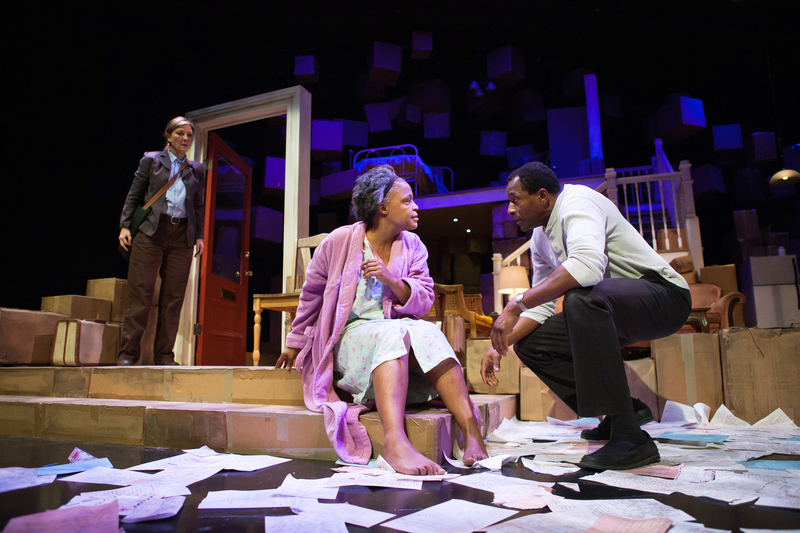 “Tree” falls within the much-mined genre of the American family drama, and it is a great credit to Ms. Hébert that she manages to make this material new and fresh, creating a play that is richly personal in its depiction of family, yet firmly routed in complex social realities of race, region and economics. Her work reflects a nuanced sensitivity for what has come before in American drama, effectively incorporating influences of some of our finest dramatists on the American family, such as Eugene O’Neil, Samuel Shephard and (especially) Tennessee Williams. Williams’ influence is evident in the use of images and ideas that might be described as “southern gothic”: there are deeply buried family mysteries, deaths, a home cluttered with boxes filled with secret papers and memoranda — literally, the baggage of a lifetime — and even a madwoman in the attic. The madwoman is the very impressive Black family matriarch Mrs. Jessalyn Price, a retired middle school teacher suffering from dementia (wonderfully played by Cathleen Riddley) who is cared for by her son Leo, a soft-spoken, talented man (Carl Lumbly), the divorced father of teenager J. J. (Tristan Cunningham) who pays daily visits to care for her Grandma while Leo is working as a chef in an upscale restaurant. The action of the play is initiated by an unannounced visit from a white woman from the deep rural south, Didi Marcantel (Susi Damilano). Didi claims to be a journalist writing a story about the experiences of Black families who left small towns in the South for the big city of Chicago, but it is soon revealed that she has a quite different agenda. She and Leo share the same father, a southern white man, who recently passed away. Didi and her father were estranged, and she seeks to know him better by bonding with her half brother. Leo wants none of it. The rest of the play involves the developing relationship between these interesting characters, as family secrets and intimacies are uncovered and ultimately embraced. The story unfolds with many unexpected surprises, satisfying character growth, and moving emotional content. “Tree” is a very good play, but not a great play. Its skillful use of metaphor (the madwoman in the attic, the baggage in the boxes) is more slick than profound and the result is excellent work that falls short of being superior. This has not prevented Director Jon Tracy and his team from creating a top notch production. The set (Nina Ball), costumes (Abra Berman), and lighting (Michael Oesch) are perfectly matched to the content, supportive but not intrusive. The actor’s performances are top notch. As Mrs. Jessalyn Price, Cathleen Riddley captures the tragedy of dementia but manages to communicate the fullness of character that preceeded it. Her moments of lucidity are convincing and effective. Carl Lumbly, as Leo, is particularly outstanding (as he usually is). In Leo, he has created a character who is soft spoken and easy going, yet full of compexities which he keeps well hidden. Mr. Lumbly does a very impressive job of suggesting great depth and sensitivity in a character who is extremely buttoned down. Susi Damilano as Didi brings depth to a recognizable southern “type”; her accent and mannerisms capture the regionalisms to perfection and root her character deeply in geography and history. Kudos to Ms. Damilano and her dialect coach, Lynne Soffer, for some very impressive work. As granddaughter J. J., Tristan Cunningham has less to do than others in the ensemble, but carries it off with intelligence and grace. “Tree” touches both heart and mind. It is quite lovely. “Tree” by Julie Hébert, produced by San Francisco Playhouse. Director: Jon Tracy. Set Design: Nina Ball. Costume Design: Abra Berman. Sound Design: Theodore J. H. Hulsker. Lighting Design: Michael Oesch. J. J. Price: Tristan Cunningham. Didi Marcantel: Susi Damilano. Leo Price: Carl Lumbly. Mrs. Jessalyn Price: Cathleen Riddley. Posted in Reviews.Tagged Abra Berman, Carl Lumbly, Cathleen Riddley, Charles Kruger, Jon Tracy, Julie Hébert, Miochael Oesch, Nina Ball, San Francisco Theatre Reviews, SF Playhouse, Susi Damilano, theatrestorm, Theodore J. H. Hulsker, Tree, Tristan Cunningham.